Sometimes living the good life in cities like LA, New York, and San Francisco can only be accomplished by having a roommate. It might not sound like the most ideal post-collegiate living situation, but if you set and follow some key guidelines, living with a roommate can actually be a pleasant experience. Before we dive in however, let it be known that the foremost rule is to maintain the practice of basic human decency, and to pick a roomie capable of doing the same. Basically, don't be a [insert four-letter word here]. Stick to the following roommate guidelines, and living together will be a breeze. 1. Do: Address financial matters early on. The worst kind of tension possible comes from money issues, so make all financial agreements with your roommate crystal clear right from the start. Establish an agreed upon system for monthly rent payments, and stick to it. When it comes to shared items, have upfront discussions about pricing, quality, frequency of use, and how you'll divide big ticket items (such as furniture) when you eventually part ways. 2. Don’t: Leave a mess behind. Let's be honest: No one wants to clean, or look at a mess, especially when you weren't the one who created it. When you're finished cooking, showering, entertaining, or working out, don't forget to clean up after yourself (and pick a roommate who does the same). 3. Do: Be clear on what’s shared, and what isn’t. Avoid ruffling feathers by being clear about what's shared, and what's off limits. This is particularly important regarding food. Establish a protocol for shared spaces like kitchens and bathrooms, deciding which products are communal, as well as how to kindly communicate when things need to be replaced. 4. Do: Make an actual (written) set of roommate guidelines. Regardless of whether you and your roommate are the kind of Type-A personalities who love making lists, coming up with a set of roomie-guidelines is a big step towards living together in harmony. And even if it feels a bit childish at first, actually taking pen to paper (or fingertips to keyboard) and writing down your house rules ensures that everyone is on the same page. It also allows both parties to establish equal authority within the shared living space. 5. Do: Respect each other's personal space. Yes, the 'mate' part of 'roommate' means you'll be sharing common areas like the kitchen and living room, but personal space is still personal. To keep roommate relationships running smoothly, respect each other's personal space and resist any urges to snoop. 6. Don't: Invite friends over without giving advance warning. Nobody likes being surprised by strangers in their house, so make an agreement with your roommate to give each other adequate forewarning when having guests over. Adequate warning occurs well before your guests arrive — meaning days before, not hours. Mastering this guideline is the key to a long-term, stress-free roommate situation. We all need to take a beat and retreat into solitude from time to time, and deserve the chance to do so in the comfort of our own homes. Once you know the patterns of your roommate's comings and goings, use the latter to enjoy some alone time at home. And depending on the urgency of the situation, you can always just ask to have the place to yourself for a few hours. 8. Do: Create extra storage space in shared bathrooms. Here's where setting some house rules really makes a difference. Sharing a bathroom can be tricky, but adequate storage space tempers the awkwardness. Make sure you and your roommate both have access to everything you need in this particularly personal shared space. 9. Don’t: Let things fester. If something's bothering you, don't wait to bring it up. Within reason, it's better to voice your objections when they occur rather than after the fact. You'll have a specific point of reference to back up your argument; and, you'll lower the potential to blow things out of proportion as resentment grows over time. 10. Don't: Borrow your roommate's stuff without asking first. It's a common sense roommate rule, but it bears repeating all the same. Hopefully, after agreeing on your general guidelines you'll settle into an amicable living environment in which borrowing is perfectly fine, but until then, it's always better to ask for permission than for forgiveness. And if something you borrow gets damaged, be sure to replace it right away. 11. Do: Be mindful of the time. Here's another common sense roommate (not to mention, neighborly) rule: Keep your noise and activity levels to a minimum during the early morning and late night hours. If you're a night owl or an early bird use headphones, and tread softly. 12. Don't: Forget to re-stock the bar after you entertain guests. There is nothing worse than inviting a couple of friends over for wine and The Bachelor, only to discover that your roommate drank it all during her Netflix binge the weekend before. Keep the good times rolling and the spirits flowing by simply making a note to yourself to re-stock the bar cart immediately after you entertain guests. Or, better yet, buy extra before your friends come over. 13. Do: Create a monthly chore schedule. Make sure you and your roomie are on the same page and schedule, at least when it comes to cleaning. Keep your humble abode neat and tidy by divvying up the household chores every month. Creating a schedule will keep you both organized, and your apartment spotless. 14. Do: Invest in decorative trays to separate your mail. While paperless billing has eliminated a lot of mail, it hasn't gotten rid of all of it. Until that day arrives, it's worthwhile to put a system in place to separate your mail. Invest in a couple of decorative trays that you can put in an agreed upon location to keep things organized. This way you can make sure that you'll continue to receive your Kinfolk subscription and all of your birthday cards from Grandma. 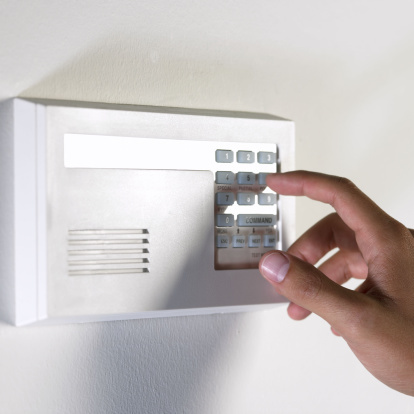 What are the Advantages & Disadvantages of an Intrusion Detection System?